ENcome Energy Performance has re-located its UK Head Office to Hereford, strengthening the team currently based in Rotherwas. 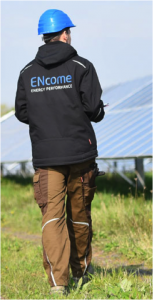 Voted as Europe’s leading operation and maintenance (O&M) provider in 2016 – ENcome Energy Performance provides technical solar services to the hundreds of solar farms here in the UK and across Europe. Rotherwas was chosen as an ideal location as it provides good transport links, a choice of office accommodation and the new University will provide access to graduates wishing to pursue a career in the Clean Energy sector. Although in recent years the Solar PV industry has faced challenges from questionable Government decisions, the need for maintenance of existing solar farms has not diminished. Further opportunities for the business exist in the current pipeline of new solar sites– approximately 3.3GW of new solar projects are being planned in the UK alone. When these sites are built, they will supply low carbon energy for more than 2,000,000 homes.